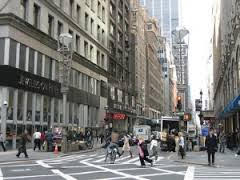 Tourists Welcome on 47th Street | Cohen Bros.
NYC attracts tourists from all over the world. You might want to consider coming to 47th Street while you are here as it is one of the most interesting places in New York. On 47th Street you can run into Shaquille O’Neal or one of the original cast members from Gilligan’s Island. You never know who you might see. All of these people are unique characters. They have been in business for decades and add to the taste of the flavor of 47th street. They’ve been at their locations year after year. In fact next year is Cohen Brothers’ 50th anniversary at this same location. I always encourage my out of town customers to come see me when they are in NY. We have customers from all over the country and the world, some of whom I’ve never met face-to-face before so I always get a big kick out of meeting them for the first time. I hope you’ll put 47th Street on your agenda on your next visit to NY.